Missing out on the Knitting Workshop because of 6" of snow in Grafton, MA I decided to crochet. I haven't had any lessons doing this and thought I would wing it. I started crocheting single stitches and wrapped them into a spiral picking up stitches as I went. Having no idea how to crochet a bag I thought I had to add stitches after I determined the bottom size. Happily doing this I ended up with a ruffle of sorts. Knowing I wanted a straight tube like purse I then dropped some stitches and determined to keep the same amount of stitches around. This worked rather nicely. 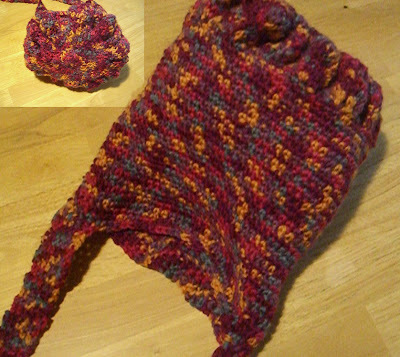 To add the strap I crocheted 9 stitches and then down to 5 until I was satisfied with the length. Attaching it on the other side I just grabbed the stitches where it met the rim. Now the fun part. I have always wanted a felted bag so now was my chance. The 100% wool yarn went into a pillowcase then into a mini cycle of hot water with a little detergent. I just started the machine and checked it in about 15 minutes. I then took it out of the pillowcase and just let it be by itself for the rest of the cycle. When I heard it spin out I wasn't sure what I was going to get. 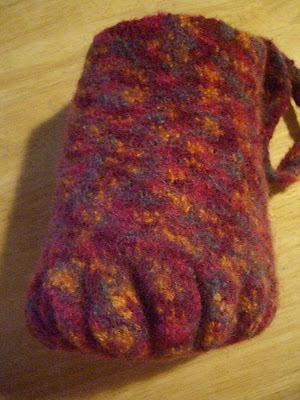 To my surprise it really felted itself and the stitches looked like they were gone. I hung it on a doorknob to dry. I was thrilled! I did it! Thanks to Boston Handmade for the inspiration and just because it snowed I kept my date with some yarn! wow, dawn, i am impressed! That's so great, Dawn! Your bag looks fabulous - love the colors!